Professional embedded systems engineers, computer engineering students taking a course in assembly language using the ARM processor. Larry D. Pyeatt earned his doctorate in Computer Science, focusing on Artificial Intelligence, from Colorado State University in 1999. He spent 13 years as a professor at Texas Tech University before moving to the South Dakota School of Mines and Technology in 2012. He has programmed in over 15 assembly languages, from mainframes to 8-bit embedded systems, and teaches a variety of courses including assembly language, operating systems, computer architecture, and probabilistic artificial intelligence. 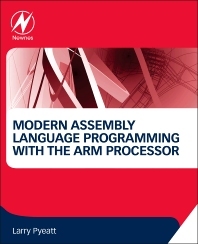 Great book for novice & experienced assembly programmers alike. Have plowed thru many ARM assembly level programming books but none so clear, concise, and useful as this one. Well worth the money!